Imagine finding yourself knee-deep in the chilly water of the San Francisco Bay. You don’t know your name, where you’re from, or why you’re there. There are no visible signs of injury, no identification, only a strange small scar. You are taken to a hospital. A handsome man appears to say he is your fiancé. He has come to take you home. The hospital staff believe him, and he takes you home. You keep searching for clues. You know things about decorating, designs, multitudes of facts, and yet you can’t remember your name. You eat candy; your fiancé tells you that you don’t like candy. There’s a piano. Do you play? He’s never heard you play. Your fiancé seems kind, but is there something he is hiding, something he isn’t telling, something you can’t remember. Why did you run away? You left to try on wedding dresses, and you never came home. Love Water Memory is told through three viewpoints: Lucie, Grady, and Helen. Lucie suffers from amnesia. The doctors aren’t sure why. They suspect an incident triggered it, but since Lucie can’t remember and Grady isn’t talking—nobody knows. Helen is Lucie’s estranged aunt and Grady tries to protect Lucie from her. The old Lucie wouldn’t talk about her childhood, her parents, or her aunt. Her parents are dead and Helen may be the only one who has the key to why Lucie has chosen to forget. Will Lucie ever remember who she was? She’s not sure she wants to. The old Lucie doesn’t have any friends. All the old Lucie did was to work ferociously as a headhunter and run. This new Lucie makes friends, she likes who she is, and yet her past haunts her. She knows she’ll never find peace or be able to marry Grady until she remembers. And when she does remember, will she still want to marry Grady? Love Water Memory is an engaging story that explores identity and how much our past impacts our present. It is a wonderful diversion for a cold January day. 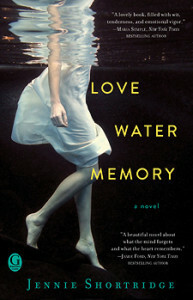 Love Water Memory by Jennie Shortridge is the She Reads selection for January.